t&p has grown up with Oracle Forms. We have based our standard software, lisa.lims, on Oracle technology for more than 20 years, finding Forms to be a highly effective development platform. Five years ago, we decided to move away from Forms as our standard software. In order to continue using lisa.lims‘s vast business logic, we decided, after evaluating all the options in detail, to develop a new Java framework that allows the basic functionality and all the advantages of Oracle Forms to be used in the world of Java. The result is our rapid.Java. rapid.Java is now enabling us to gradually migrate all customers to a new technology, avoiding risks or additional costs in the process. Our clients find rapid.Java just as effective as Oracle Forms at its best. Creating a new Java-based application from scratch costs time and money. Migrating your application using rapid.Java means a 50 percent saving by comparison, as our software already meets many standard requirements. For example, dedicated administration of user sessions, exclusive locking of data records during editing, availability of multiple languages, individual configurability of the user interface, a highly granulated system of permissions, transparent error handling, version management for master data and much more. With rapid.Java, you move your existing business logic and data model to the new application. This means you protect all the investments you have made so far. 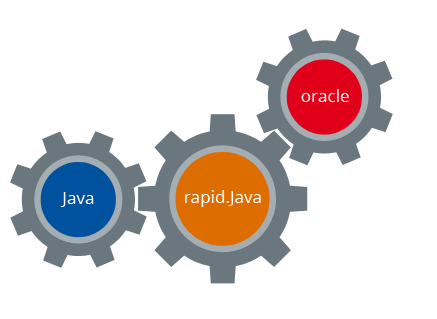 rapid.Java provides you with a controlled, module-by-module migration of your application. This means you gradually move from the old to the new and can use old modules alongside the new ones. You can be sure of project success. rapid.Java applications run on any Java web and application server. This means you can also choose servers that do not involve any license costs. No more expensive runtime environments and complex license terms. You make big savings on licenses and maintenance fees. rapid.Java is proven technology, ensuring successful migration of lisa.lims, t&p’s standard software. Until version 9, lisa.lims was based on proven technologies that lacked a long-term future: over 400 dialogue modules, more than 200 reports and almost 500 database packages. With rapid.Java, you create user interfaces that you can adjust at runtime. You can change the size of windows and fonts, choose the columns, their order and the direction in which they are sorted. You can show or hide large amounts of information, edit your data in form or table view and move individual parts of the interface around, just like in Microsoft Outlook. A single mouse click takes you back to your default set-up at any time. rapid.Java brings the proven multi-user functionality and the data integrity and consistency of your existing application to a web app: Your data records are locked exclusively for you while you edit them. Anyone else attempting to change them receives a notification that another user is currently editing the data. This is by no means a matter of course when it comes to web applications. rapid.Java is an even more user-friendly environment for you and your staff: Color-coding, symbols and interactive graphics show you the most important information at a glance. A navigational tree and favorites take you straight to where you need to be. Click on a data record and a window will pop up with additional details. Searching is easy – in all columns or in any complex views you choose. The detail data records displayed are updated as you scroll from each master data record to the next. Right-click to bring up the context menu at any time. Select the records using drag and drop. Or, if you prefer, you can control the application using function keys. All from your web browser. rapid.Java is based on the Eclipse Rich Client Platform (RCP) and Eclipse Rich Ajax Platform (RAP). This means you create your desktop and web application from the same source code. Cost- and time-efficient. And with identical layouts.